Want an easy cruciferous vegetable dish to add to your recipe box? Rapini are a great vegetable that resemble broccoli and are also known as Broccoli Rabe. Boiling the rapini before sautéing them will reduce the bitter taste that is traditionally associated with this vegetable. Cut about 1/2 inch off bottom of rapini and wash them. Bring water to boil in saucepan and cook rapini on medium heat for 5 minutes. Drain water and let cool. Squeeze excess liquid from rapini using back of spoon and pressing against colander. In a frying pan, heat oil on medium heat, add garlic and chopped tomatoes and cook for 5 minutes. Add rapini and cook until warmed. Add salt and pepper to taste. 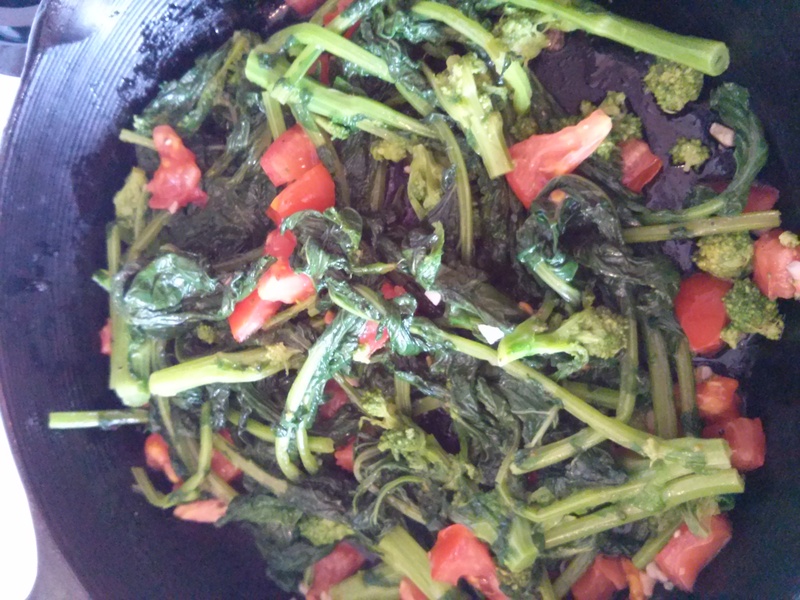 Note: Rapini can be stored in refrigerator boiled and squeezed until ready to sauté with garlic and tomatoes.